Coroplast is cut and scored for our 2 grid by 2 grid wide loft BUT the opening is NOT cut. You cut the opening depending upon where you want the ramp. The base is cut and scored so you only have to secure the flaps. Coroplast is not cut for the ramp entrance; we leave this up to you to place the ramp where you'd like. (16) Snap-in Plastic Rivets to fasten flaps. NEW! Rivets on the Flaps! We've updated our cage design to make it even easier and more secure than ever! 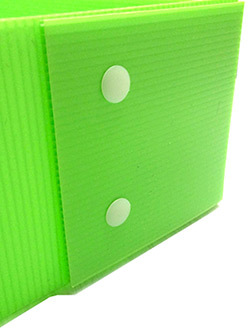 All of our Coroplast bases now come with nice, clean holes -- professionally punched in the appropriate locations. 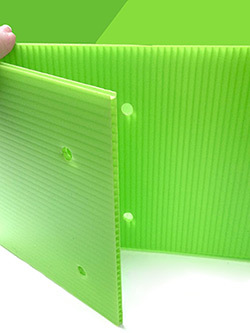 We include our new, easy-snap-in plastic rivets for securing the base. The rivets, while very secure when in place, can also be popped back open with a little separation pressure should you need to dissemble your cage and are generally reuseable.